Here’s the thing about social media: a lot of people just don’t understand how it works. Some people—including mentally challenged individuals like John Mogan, 28, and Ashely Duboe, 24—think the internet is a telephone where you talk to one or two people at a time. But it’s actually a television station, and whatever you post is broadcast instantly to the entire planet. Mogan, a parolee, had allegedly just robbed the Savings Bank in Ashville, just outside of Columbus, Ohio. 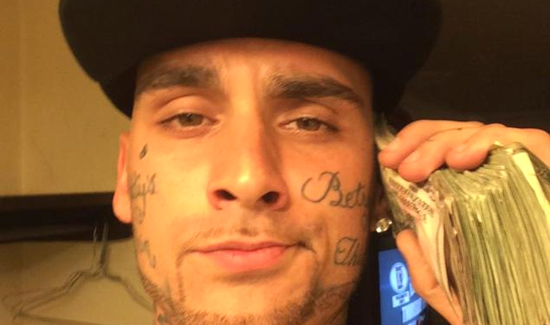 He and Duboe celebrated by posting pictures of themselves with piles of cash on their social media pages. Cops loved the photos. Not because they’re interested in photography, but rather due to their interest in catching armed robbery suspects. Police say that Mogan wore a black hoodie as he handed the bank teller a note demanding cash. Both now face felony robbery and theft charges and are being being held on a $250,000 bond at the Pickaway County jail. Can’t fix Stupid = Job security for Cops. Thank for the laugh! Love the quote “Some people…think the internet is a telephone where you talk to one or two people at a time. But it’s actually a television station, and whatever you post is broadcast instantly to the entire planet.” Just finished teaching Social Media / Sexting / Sextortion – trying to get that SAME message across to the kids! !